The next generation triple-blade razor for the closest shave with less irritation-even when shaving against the grain. 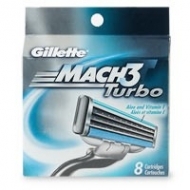 3 New Anti-Friction™ blades... so MACH3Turbo removes more of each hair with less irritation. New soft, protective Microfins... gently, smooth down the skin so MACH3Turbo can shave evenly and effortlessly. Enhanced Indicator® lubricating strip... keeps MACH3Turbo gliding, shave after shave. MACH3Turbo makes the closest shave even more comfortable.